Sadly, Jurassic Park – The Ride is facing completely extinction. The redefining theme park attraction, which opened in 1996, will be closed to make way for a reimagined version of the attraction. The Universal Creative team will be bringing Jurassic World to life in an all new experience in 2019. Am I incredibly sad at the news? Yes. Am I incredibly excited at the prospect of something fresh, new, vibrant, and technologically advanced? HELL YES! For a long time now, the animatronic dinosaurs have been plagued with problems because of the moisture of the attraction. Constantly being removed to be repaired, then placed back in only to be taken out to fix again. Regardless of that, the attraction has always been a fan favorite and there was nothing like coming so incredibly close to the heart pounding experiences of the film. We here at Theme Park Duo are beyond thrilled to see new life being brought into the attraction that we love so very much. The only down side is that Nikki is pregnant and can’t experience the original version before it leaves this world forever. But I bet you anything, I will be babysitting so she can experience the new version first hand. 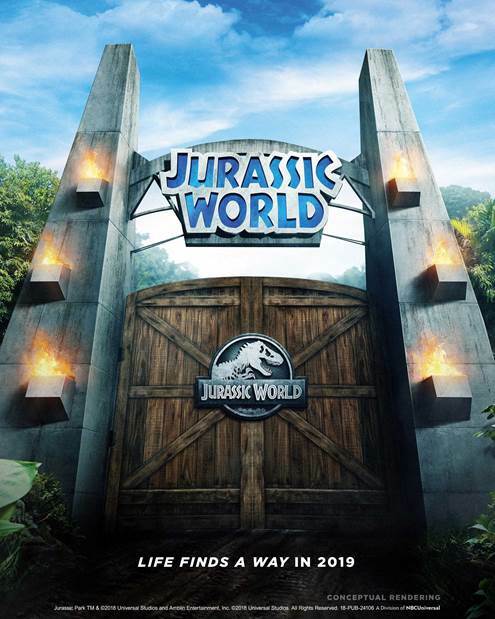 Below you will find the official press release of the new Jurassic World attraction and all the fun little tid bits that everyone will be clamoring for. “Jurassic Park—The Ride” will officially become extinct on September 3, 2018. In 1996, Universal Studios Hollywood redefined theme park thrill rides with the unprecedented introduction of “Jurassic Park—The Ride,” based on three-time Academy Award® winner Steven Spielberg’s epic film. Hailed as a technological achievement of triumph and wizardry, the ride featured newly debuted principles of hydraulic physics, mechanics and space-age robotics. Working in partnership with scientists, palaeontologists and aerospace engineers, Universal Creative—the team that develops Universal theme park rides—brought to life one of the most compelling rides ever created. Life-sized and lifelike animatronic dinosaurs, some towering over five-stories high, freely roamed the earth at Universal Studios Hollywood. Drawing from the favorite elements of the original “Jurassic Park—The Ride,” this next-generation thrill ride will be a fully reimagined iteration of the ground-breaking adventure, elevating every facet of the experience. With the introduction of never-before-seen dinosaurs, enhanced storytelling, lush scenic design, an entirely new color scheme and uncompromised state-of the art technology, the ride will capture elements never experienced within a theme park.